A lot of women choose to work up until the final weeks of pregnancy. But work can end up adding more stress to your life. 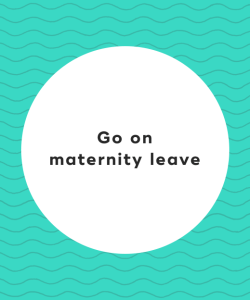 If you have the opportunity to do so, you should go on maternity leave a few weeks before your baby is due. This will give you time to relax at home and plan for the birth. Being pregnant can really wear your body out. You might experience more aches and pains than usual. 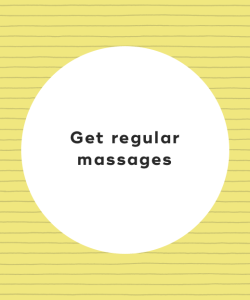 Try to get a massage on a regular basis to help de-stress. There are lots of massage places that specialize in massages for pregnant women that can accommodate you. Getting enough sleep is super important when you're pregnant. And more sleep equals less stress. Feel your best by trying to sleep 8-to-10 hours per night. You can increase your chances of getting quality sleep by keeping your thermostat in the low 60s, avoiding food two hours before bedtime, and sleeping with a body pillow. Bubble baths are the ultimate way to relax and unwind. Plus, they relieve muscle aches. You'll want to make sure the bath water is warm, but not hot. This is especially important during the first trimester when your baby is still developing. You'll want to clear any aromatherapy oils with your doctor beforehand. Exercising is one of the best ways to combat stress because it helps release endorphins. You should try walking, swimming, prenatal yoga, or prenatal pilates a few times a week. Make sure to check with your doctor before starting an exercise regimen. Acupuncture is safe during pregnancy, and it can help you de-stress. In fact, acupuncture has been shown to reduce depression in pregnant women. You should look for an acupuncturist that has experience working with pregnant women. 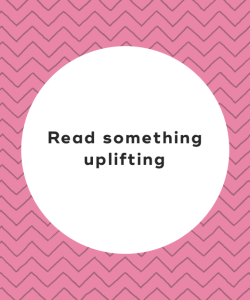 Instead of constantly reading books about pregnancy and parenthood, take a break and read something fun and uplifting. Overloading yourself with information can lead to anxiety, so it's important to mix up your reading materials. Preparing for parenthood is a huge undertaking that can easily make you feel overwhelmed and anxious. 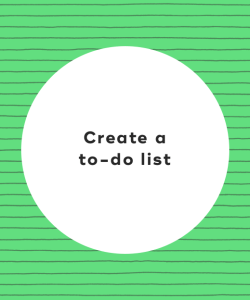 But you can reduce stress and anxiety by creating a to-do list. Start at the top of your to-do list and work your way down. Treat yourself after completing each task, and don't beat yourself up if you can't get everything done. Remember, too, that it's okay to ask for help! Meditating for 30 minutes a day can help you unwind and calm down. To meditate, all you simply have to do is sit down in a chair with one hand over your heart and one on your stomach. Inhale deeply while you count to four and then exhale while counting to four. Focus on love and peace during meditation. Food easily affects stress levels. Caffeine, fat, and refined sugars can all make you feel sluggish and anxious. That's why it's important to eat nutritious foods throughout your pregnancy. Focus on unprocessed whole foods such as grains, lean meats, low-fat dairy products, fruits, and vegetables. You'll notice that you feel calmer. It's hard not to stress out during pregnancy, especially if you're going to be a first-time parent. But you can easily de-stress and relax while you're pregnant by taking some much needed me time -- make sure to eat healthily, exercise, and meditate. Whatever you do, don't be afraid to ask for help if you feel too overwhelmed. "5 Natural Ways to Relax During Pregnancy," Inhabitots, February 27, 2011. "How to Deal with Stress During Pregnancy," The Bump, n.d.
"How to Relax During Pregnancy in 12 Steps," BabyMed, May 24, 2009.